Does one in six Americans struggle with hunger? 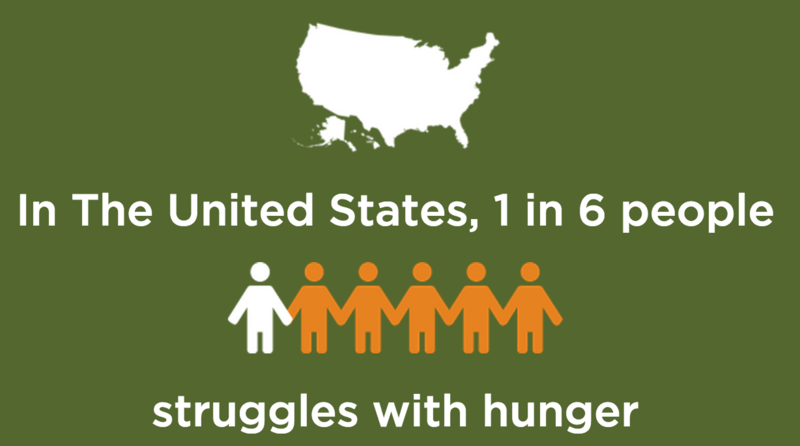 Feeding America claims, that one in six US Americans struggles with hunger. Is the definition of "hunger" they use similar to the one when talking about hunger for example in sub-Saharan Africa? “The food that we bought just didn’t last and we didn’t have money to get more.” Was that often, sometimes, or never true for you in the last 12 months? “We couldn’t afford to eat balanced meals.” Was that often, sometimes, or never true for you in the last 12 months? (If yes to question 4) How often did this happen—almost every month, some months but not every month, or in only 1 or 2 months? (If yes to question 9) How often did this happen—almost every month, some months but not every month, or in only 1 or 2 months? The remaining 14.3 percent (17.5 million households) were food insecure at some time during the year. That is, they were, at times, unable to acquire adequate food for one or more household members because they had insufficient money and other resources for food. A majority of food-insecure households avoided substantial reductions or disruptions in food intake, in many cases by relying on a few basic foods and reducing variety in their diets. 5.6 percent (6.8 million households) had very low food security—that is, they were food insecure to the extent that eating patterns of one or more household members were disrupted and their food intake reduced, at least some time during the year, because they could not afford enough food. So if the criterion is that one or more persons in ones household had to at least reduce the variety of food they eat, 1 in 7 people struggle with hunger in the USA. If the stricter criterion that one or more persons in ones household had to actually reduce their food intake, it is more like 1 in 18. Not the answer you're looking for? Browse other questions tagged nutrition united-states . Does cooking with extra virgin olive oil cause cancer?